We've covered some of the basics of straight line braking on a level surface, but what about braking with a passenger, or braking in a curve or on a hill? And does braking technique need to be different for sports bikes or cruisers? Braking technique needs to change as the load on the bike changes. Extra load on the bike, whether traveling gear or a passenger, adds forward energy to the bike that needs to be decelerated. Most importantly, additional weight on the rear wheel increases rear tire traction, and the change in front/rear weight bias requires a change in braking technique. A passenger's weight is typically high on the bike, and that results in greater transfer of forward energy onto the front wheel. Hard front braking is still possible, but more braking will be required on the rear wheel when carrying a passenger. The limiting factor in aggressive braking with a passenger may not be the brakes or tires, but how well the passenger is able to resist the deceleration. The passenger may not be prepared for a quick stop, and there is little to brace against even if the he or she is aware of the situation. As the rider applies the brakes aggressively, the passenger slams forward into the rider's back. Or, more correctly, the bike pushes the rider back into the passenger. At the point where the rider is being pushed up onto the tank by the passenger's inertia, the rider must ease off on braking in order to maintain control of the bike. 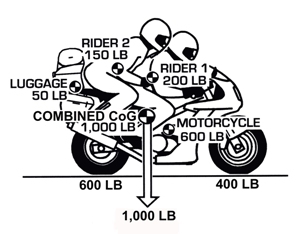 A touring bike with two riders plus gear might weigh a total of 1000 pounds, with a rear/front bias of perhaps 60/40. At the start of braking, rear tire braking could be 600 lb. and front braking 400 lb. But as braking increases to, say, 80% of available traction, the braking forces might be around 200/600 rear/front. A heavier passenger will have greater forward energy, and push even harder into the rider. At the start of braking, rear/front braking forces might be 600/400, but as weight transfers forward during aggressive braking, the braking bias might be 200/600 rear/front. When the bike is leaned over into a curve, the tires are consuming a lot of the available traction forcing the bike to turn. 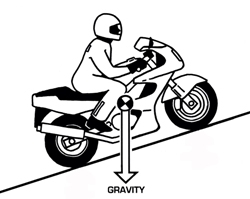 Depending upon the risk acceptance level of the rider, the bike could be leaned over to the point where there is little or no spare traction available for braking. If the rider grabs the brakes aggressively in such a situation, the likely result is a low-side crash. Braking too hard while leaned over can easily result in a "low side" crash. 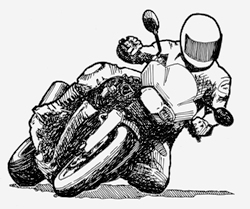 To avoid a slideout, the rider could brake very gently while gradually reducing speed. As the bike decelerates, lean angle can be reduced, which reduces the cornering demands, and allows more of the available traction to be used for braking. In other words, cornering traction can be traded for braking traction as the bike is lifted up. 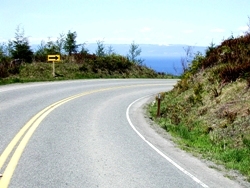 An alternate method of doing a maximum effort stop in a curve is to quickly straighten the bike to vertical, then attempt to stop in a straight line within the roadway available. That technique favors braking systems such as ABS, integrated, and power assisted that work best in straight line stops. 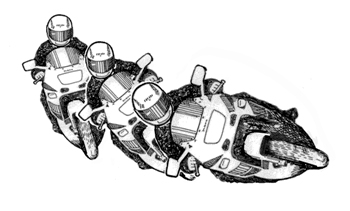 One technique for a quick stop in a curve is to quickly lift the bike vertical and do a maximum effort straight-line stop, but the higher your entry speed, the greater the stopping distance. The down side of attempting a straight-line stop from a curve is that it's easy to run out of pavement before you get the bike stopped. 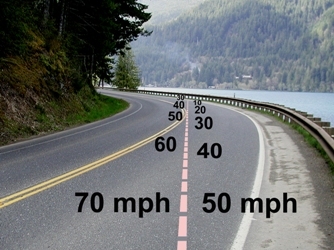 For instance, consider attempts to make "straight line" stops from speeds of 50 mph and 70 mph. From 50 mph, a good rider should be able to lift the bike up and brake to a stop within 100 feet. But from 70 mph, stopping distance for that same machine would be more than 175 feet, due to the increased forward energy, so the bike might still be decelerating through 30 mph when it runs out of road. The important point of this is that if you enjoy riding curvy roads at more aggressive speeds, you need to be more skilled at braking while leaned over. You'll need to smoothly ease on the brakes at first, then brake progressively harder as the tires reduce their demand for cornering traction. As you scrub off some speed, you can either continue to brake while turning, or lift the bike up and do a maximum effort straight line stop. Up to this point, we've discussed braking on a level road. Obviously, braking dynamics change on hills. Braking heading uphill is easy, because gravity helps slow the bike, and because the weight bias is moved toward the rear. However, braking heading downhill is more difficult, because the downslope pull of gravity adds to the forward energy, while the weight bias is moved toward the front wheel. The downslope pull of gravity is a constant, depending on the grade. However, downslope gravity is added to forward energy, and kinetic energy increases dramatically with increasing speed. When riding downhill, it's important to keep speed under control, especially on a curvy road. Engine braking is less effective descending a steep grade because traction on the rear tire can be severely reduced. Approaching a downhill curve, brake early while still in the straight, to avoid having to brake hard while leaning the bike. Downhill left turns are hazardous because the pavement often cambers to the right, reducing traction and leanover clearance. Even in a downhill right turn, it may be necessary to trail brake all the way around the curve to keep speed from increasing. In downhill turns, trail braking on the front will help keep speed from increasing, and also make steering lighter. As front suspension is compressed during braking, the steering axis steepens, with the result that steering trail is reduced, making steering lighter. That means less steering effort is needed to get the bike turned. However, when braking into curves, it is essential to be very smooth when easing on or easing off the front brake, to avoid sudden changes in traction.